First up, for anyone unfamiliar with Sideswiped, can you tell us about the show as a whole, as well as your character? Carly Craig: Sideswiped is a multi-generational comedy about dating in today’s digital society. It’s a very grounded, real tone that touches on relationships – both romantic and familial. I play Olivia Maple, who’s frustrated with her single life at 35, so she gets on Tinder after being spurred on by her younger sister Jayne (played by Chelsea Frei), [who is] married and wanting to live vicariously through Olivia, and her widowed mom Mary (played by Rosanna Arquette), who’s killing it on the dating apps. Is there an element of Sideswiped that you’re especially excited for viewers to see? I’m excited for people to discover that Sideswiped is about so much more than just dating, and to hear what people relate to after watching the series. Even the opening scene, [which is] based on an experience of my own where I was expecting my female gynecologist to walk in, but a super-hot, male-model-looking gyno came in instead. And I was not waxed and ready for my close-up! The doctor is played by Jason Sudeikis. You immediately get the tone of the show and how these real-life situations that we all deal with are what make us laugh out loud and relate to these characters. In addition to starring in Sideswiped, you’re also the show’s creator – and you based it on a true story. Was there a specific incident or situation that inspired you to take the leap and turn your experiences into a comedy series? Were there any points at which it felt uncomfortable to pull from such a personal place? I had just gotten out of a 12-year relationship and found myself single and dating at 35. I was telling my friend (and Sideswiped co-creator) Daniel Reisinger about my experiences in the dating world and he helped get me on Tinder. Dan and a few of my friends basically took it over and started swiping on everyone. I actually met my boyfriend from that one night of swiping, so that was the jumping-off point. But I always knew I wanted to write about my real-life situations, dating and other embarrassing moments. I write down my experiences all the time. Like the Starbucks scene in episode one – that happened to me. I started writing the whole script from that scene because I thought it was so fascinating how someone doing a good deed could just ruin your day. I found it somewhat cathartic to write about personal experiences. Like the fertility stuff in episode 6 was very close to me, but I enjoyed writing it. Reliving it as an actor was a little draining, but reading messages from people who watched it and related to it and were happy that someone was talking about it made me feel really good. As the series progresses, we see your character Olivia go on dates with a variety of Tinder beaus. To what extent are those encounters based on real-life events? Did you ever feel the need to exaggerate for comic relief? A lot of these are based on real-life experiences, but I definitely wrote from my imagination, too. There’s an array of famous names on the show’s list of guest stars. What was it like collaborating with them? Was there anyone you were particularly intimidated to work with? It was amazing! To work with people that I was such a big fan of was surreal. I thought I might feel intimidated, but they were so nice on set, I never did. Rick Springfield was playing guitar in-between takes, Peter Gallagher was telling the best stories from his career, [and] Jason Sudeikis and Tom Lennon had us cracking up the whole day. It was awesome. 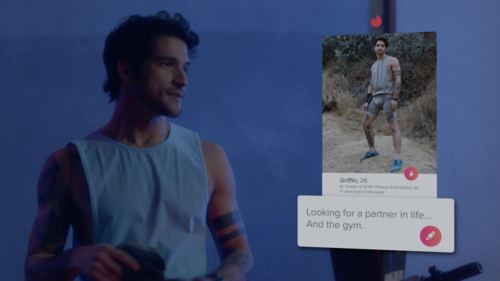 We love the concept of “swiping right on life”! What message(s) would you like viewers to take away from Sideswiped? How do you hope the series will inspire viewers to live their lives differently? Thanks! I think the idea of being more open minded/trying new things is one thing I’d love for people to take away. But also, I think a lot of us grew up watching and reading fairy tales that teach us to find our prince and live happily ever after. And you’ll see how that affects characters like Jayne and Mary on the show. I hope people can take from this how important it is to get to know yourself and love who you are, not find that happiness in someone else. If someone fits in once you’re ready, that’s what you want. The ingredients of a top-notch Tinder profile have long been debated. Care to weigh in on this divisive topic? That’s a tough one. I think just be yourself. Don’t put up pictures with you and a bunch of girls next to you, or holding up your shirt revealing your abs, or taking a bathroom selfie. Just put up a few pictures that best represent your personality and don’t get too crazy on the bio. Keep it simple. In the same vein, how much personal information do you think a Tinder bio should reveal, and how much should be shared one-on-one? How do you feel about cliché profile photos (e.g. gym selfies, standing in front of a famous landmark)? Not a fan of the cliché profile shots. Like I said, just be yourself. A nice smiling picture goes a long way. And I don’t think there should be too much personal info revealed on Tinder. Keep that for the one-on-one. YouTube Premium is a relatively new streaming platform. What was it about the subscription service that made it feel like the right home for this project? I loved being able to get in on the ground floor with a company that was just starting to transition to premium programming. They’re doing amazing things and I couldn’t be prouder to be a part of it. Since all eight Sideswiped episodes premiered on July 25, the series has become the latest option for YouTube Premium subscribers looking to binge-watch a new favorite. Tell us about some of your binge-watching go-tos! On YouTube Premium, I loved Cobra Kai. My favorite comedy to binge-watch is Catastrophe. It’s so good. And now I’m watching Babylon Berlin. Thanks to Carly Craig for chatting with us! To keep up with Carly, follow her on Twitter and Instagram. Don’t be surprised if she pops up on stepsister Mandy Moore‘s social media from time to time as well! As for Sideswiped, the first two episodes are available for free on YouTube. Check out the premiere episode and you’ll be hooked before you know it! To watch the entire series and unlock access to other YouTube original series, movies, music and more, sign up for YouTube Premium.